When searching around the internet for “playground equipment for sale” you probably didn’t expect to come across pictures of a bunch of kids running around inside a pen that’s shaped like a stop sign. When most people shop around for playground equipment for sale, they expect to see swingsets, merry-go-rounds, and balance beams. And for years, these have been the only options for kids outdoor play equipment. Well, it’s out with the old and in with the new. Octopit is here to usher in a new generation of playground equipment for kids who like to be physically challenged while having fun! Still, we realize that many people have yet to hear about Octopit and the popular game that’s played within it, called gaga ball. That’s why we’ve put together a short list of frequently asked questions about gaga ball. Read over them so that you can become more familiar with this fun pastime that’s taking the world by storm! 1. Where was gaga ball invented? Gaga ball was invented in Israel during the 1970s. At that time, children in Jewish communities were searching for a game that could include many participants but didn’t require a lot of complicated equipment. Gaga ball to the answer! Played inside an eight-sided pen called an Octopit, this fun game can include dozens of children at once while only requiring a single foam ball! 2. What does “gaga” mean, anyway? Wondering where this game got a weird name like “gaga ball”? In Hebrew, this term translates to “touch-touch” a reference to the way that players only touch the ball momentarily with their hands while also trying to prevent the ball from touching their legs! It’s also customary for the players to shout “ga!” the first time the ball bounces after being tossed into play, and “ga!” again on the second bounce. In some communities the game may also be known as Israeli Dodgeball, Octo-Ball, or Panda Ball. 3. Can kids get hurt playing gaga ball? One of the best advantages of playing gaga ball in an Octopit rather than buying other playground equipment for sale is that it’s much safer. Unlike swingsets or merry-go-rounds, kids can’t fall off of an Octopit or get nauseous playing gaga ball. Played only with a foam ball, there’s very limited opportunity for kids to fall or be injured while playing the game. 4. How old do you have to be in order to play gaga ball? The great thing about dodgeball is that it can be played by people of all ages! 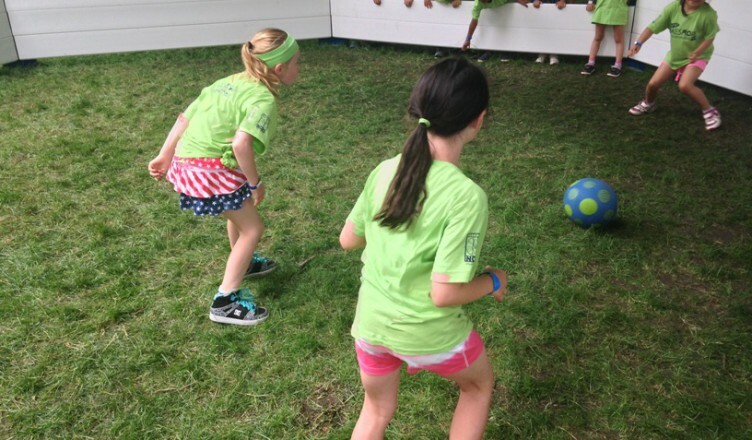 We’d say that gaga ball is probably most popular among middle school-aged children, but we’ve seen it played at summer camps, youth group parties, church picnics, and on playgrounds by children as young as three or four! Kids often have the most fun when everyone in the Octopit is close in age, so skill levels are similar. 5. How do you win a game of gaga ball? Great question! Gaga ball is a lot like dodgeball in that it’s a “last man standing” type of game. If you’re hit below the waist by the ball, you’re out and must hop over the side of the Octopit until the game ends. If you’re responsible for getting the last person out, you win! Be aware that the detailed rules of gaga ball may vary from group to group. Request a FREE quote for your Octopit online today!